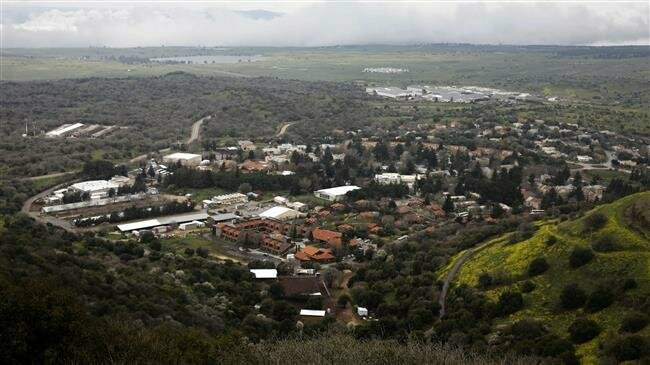 US President Donald Trump’s belief that the occupied Golan Heights belongs to Israel is a “delusion” and underscores the US leader’s mental instability, an American scholar and political commentator says. Trump signed a proclamation on Monday recognizing Israeli “sovereignty” over the Syrian territory of Golan Heights, triggering a global outcry. Trump signed the decree at the start of a meeting with Israeli Prime Minister Benjamin Netanyahu at the White House. “Trump’s belief that the Golan Heights belongs to Israel is very much a delusion, sort of like [Venezuelan opposition leader] Juan Guaido’s belief that he is the president of Venezula,” said Kevin Barrett, an author, journalist and radio host in Madison, Wisconsin. “Trump seems to think that he can just sign a proclamation and change reality,” Barrett told Press TV during a phone interview on Thursday. “Trump is completely psychotic as he goes around like a bull in a china shop destroying international agreements like the Iran [nuclear] agreement…but this one is a very serious one,” he added. US President Donald Trump’s formal recognition of Israeli sovereignty over the occupied Golan Heights has killed any chance of peace with Israel, analysts say. Trump’s illegal move on the occupied Golan Heights has assured that Israel will be in a perpetual state of war with its Arab and Muslim neighbors for many decades, according to experts. Trump’s decision, following US recognition of Jerusalem al-Quds as Israel’s capital in December 2017, could also tempt other regimes to annex land, undermine Washington’s so-called peace plan between Israelis and Palestinians and tilt Israel back into conflict with its Muslim neighbors, Middle East analysts say. Iran, Turkey, Lebanon, Russia, and some European Union (EU) states were quick to reject Trump’s move, which is an obvious violation of international law.